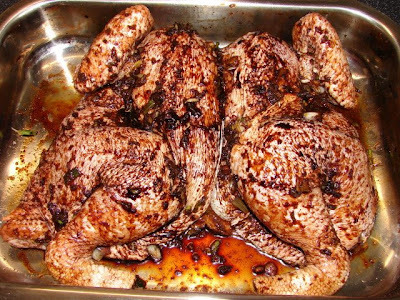 When I roast chicken I normally like to marinate it for a while to give it a nice flavour. This oriental style recipe isn't anything from a known recipe. It's tried and tested, I have repeatedly made this for years. For the chicken I normally use a medium chicken, amount of marinade adjusts to the size of the chicken. First spatchcock the chicken. Cut the chicken open along the centre backbone using a meat scissors/shear. Then open up the chicken like a book, and using a large knife gently crack the centre top of the breast bone without cutting into the meat, this helps the chicken to lay flat without using force to press the chicken breast flat from the skin side. Then take 1 fat clove of garlic, 1 stalk of spring onion and 1 small piece of ginger, crush them to a rough paste using a pestle and mortar. Add this to a mixture of 0.5 tsp of salt, 1 heap tsp of five spice, 1 tsp of sugar and 1 tbsp of mushroom dark soy or normal dark soy. Put the chicken in a large plastic bag or a roasting tin, rub the marinade all over the skin and bone, then leave the flavour and colour (soy) to penetrate for 3 - 4 hours. Scrap off bits of marinade on the chicken. Put a wire rack on a roasting tin follow by some water* then rest the chicken skin side down on the rack. Roast at 190 - 200 deg C for about 30 minutes, turn over skin side up and roast for another 30 minutes till golden brown. If using a small chicken total roasting time is about 50 minutes, for a large roaster around 1 hour 10 minutes. *Add enough water to the roasting tin to about 1cm high will help to avoid chicken juice hitting the red hot roasting tin and spit all over the place, making such a mess to the oven. Also the juice collected using this water method will not burn or char. Rest the cooked chicken before cutting into pieces. The juice collected on the roasting tin can be reduced to serve as a sauce. Do skim off the fat. I find roasting chook using this recipe has always been very juicy and tasty, far better than roasting it the traditional English method. 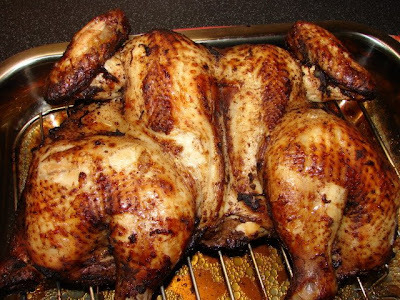 ** This marinated chicken is suitable for bbq too. I always serve this roast chicken with a ginger chilli sauce from this recipe. Blend all the ingredients together in a mini blender till smooth. This chilli sauce is quite hot when freshly made, if you have enough left over can keep in the fridge for few days, the longer you keep it the milder it gets but still nice. 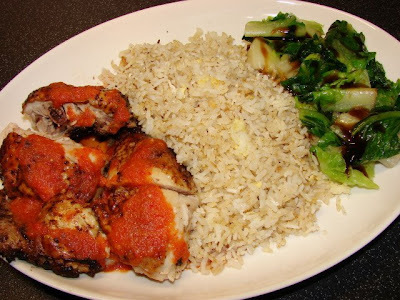 Here is the meal with my oriental roast chicken, ginger chilli sauce, egg fried rice and stir fried cox lettuce with oyster sauce.